When we were in London last August, we took the train from the Waterloo station to Windsor and Eton Central. After we explored the Windsor Castle (which is my absolute favorite castle of all time! 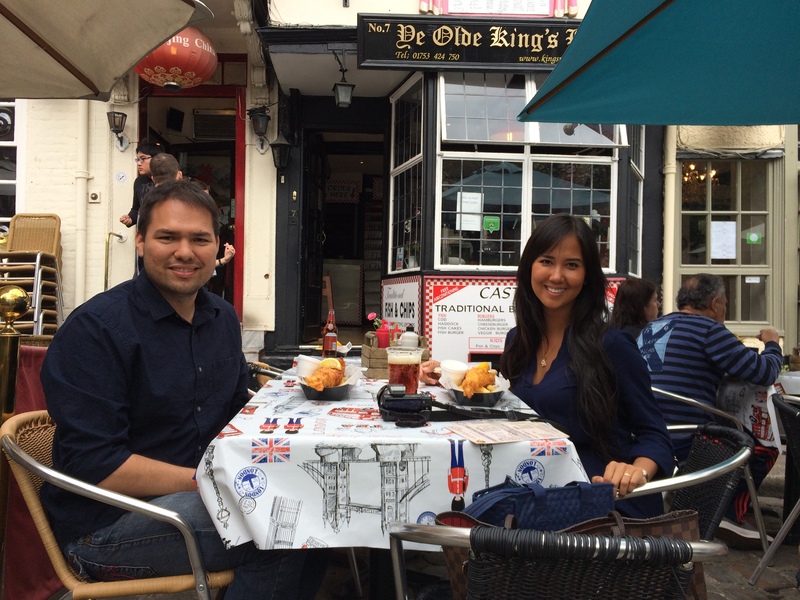 ), we stumbled upon the Ye Olde King’s Head restaurant. The only restaurant that we have seen that offers gluten free fish and chips! So last Sunday, with my belly growling for fish and chips, we hurried ourselves to the Waterloo station. Fail no. 1. The train to Windsor and Eton Central were not running. They had some track problems and the alternate route from Waterloo was too complicated, with train and bus transfers. We did find out that there was another way to get to my gluten free fish and chips, via the Paddington station. We got there and went to the ticketing booth. Awesomest thing ever, if you buy your tickets at the station for a group of people, you get a discount. If we had taken the train from Waterloo, it would have cost us about 12-15 pounds per person. We paid 21 pounds in Paddington for 3 persons. Who doesn’t love a discount, right? We boarded the train and in 32 minutes we had to get off at Slough for the train change. From there it was a quick 6 minute train ride to Windsor. Walking in a fast pace, we headed to the restaurant. Fail no. 2. We got there and it was close. Should have called first!!! I asked around and found out that they were close til March. The owner went on a fishing trip. Noooooo…..
We ended up a the Turner’s Restaurant which was right next door. I came for fish and chips, I was eating fish and chips, gluten free or not. I’m not a fan of cheat days or cheat meals. This is when you allow yourself to eat the stuff that you eliminate from your diet. But it was already 2 pm, I had my heart set on fish and chips, and so I caved in. Fail no. 3. Bad idea. About 20 minutes after my lunch, I felt nauseous. I wasn’t getting itchy, and I could still breath, but I felt horrible. I just wanted to shut down, curl into a ball and sleep. While our friend, Manjula, went it to Windsor Castle to explore, Marco and I walked around town, going in and out of the shops. But I felt soo bad I couldn’t even get myself to really look around. I’d have to say that Sunday was a let down. It was cold, as always, I felt horrible and I didn’t buy anything. Worst 3 combinations ever.